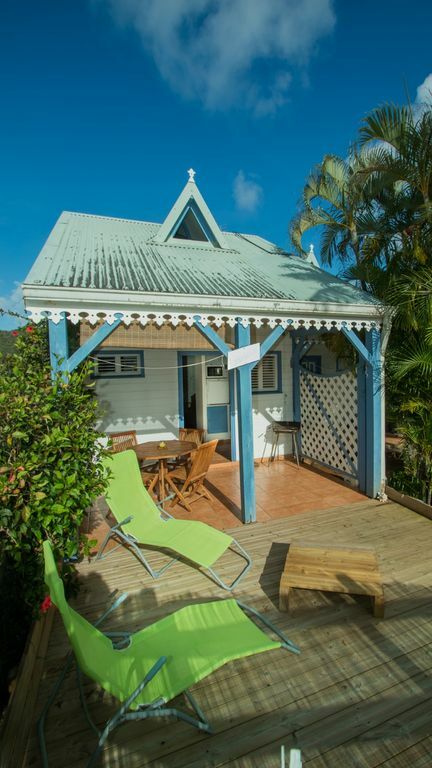 This tiny bungalow is perfect for two. Excellent TV and wi if and agreeable host who left us not only coffee but bananas, cantaloupe, rum, limes and cherry fruit juice. The outdoor dining area is screened by a large hibiscus that hummingbirds frequent. It and neighboring cottages are in the creole gingerbread style. Sleeping loft is upstairs. A five minute drive to a charming village, St Anne, with covered spice market and excellent restaurant (Delim's). Spectacular Les Salines beach 15 min. Drive. Irenee was the perfect responsive host and the bungalow was all that was advertised - just right for two people with everything you need. Kitchen, bath, AC, tv, WiFi all worked perfectly and house was situated just right for easy access to town and beaches. Lovely, quiet little cul de sac above the village of Sainte-Anne. Not exactly walking distance to town but only a few minutes drive.